Even though we're all (me most of all!) geared towards Fall right now the truth is we still have a few warm days ahead of us. 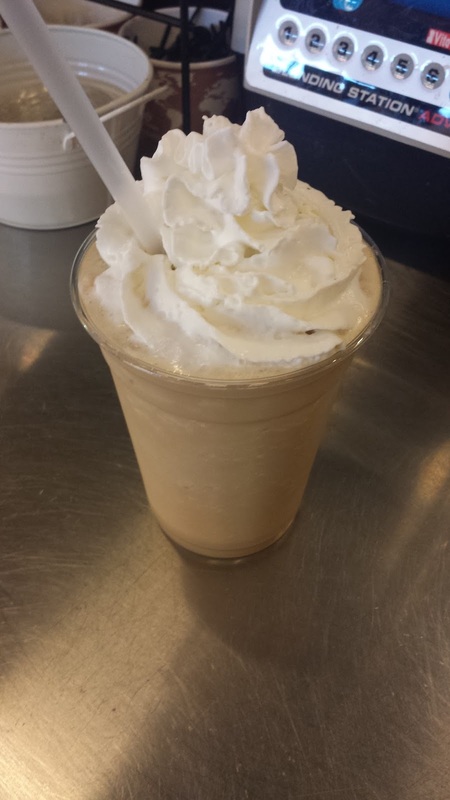 Before it got too cold I thought I'd share my recipe for our Irish Cream Frappe. You can also make this hot by omitting the ice and adding more coffee! Just a note, this is full fat so you've been fairly warned! As much whip cream and white chocolate syrup as you want for garnish. Making it is simple, throw all the ingredients into a blender and blend away! I use 1 cup of ice and the coffee is hot when I blend, which to me makes the best frappe consistency. If you want it smoother or thicker adjust ice as needed. To garnish, top with whip cream and line cup with white chocolate syrup (this is optional but adds a nice touch!) Keep in mind, this can always be adjusted to your own taste, which I definitely suggest! Use skim milk or Splenda to cut calories if that's your thing, or go the full fat way (like I prefer!) by following the recipe above. Enjoy!!! This looks and sounds amazing! I love how it is so quick and simple to make too :D thank you for sharing! I'm so excited and I just can't hide it!! I know I know I know I want this!!!! Thank you for this wonderful recipe! I hope your week is flying by my gorgeous and talented friend!! This sounds so yummy Kim! I definitely need to have a go at making this. I hope you are well my gorgeous friend and have an amazing weekend planned!